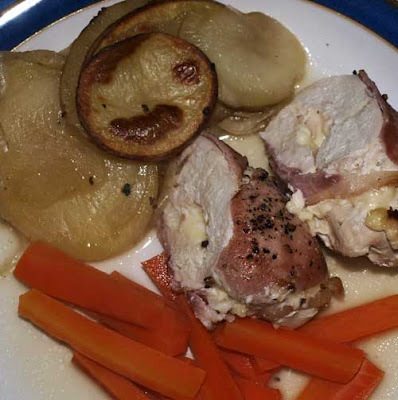 I started out with a recipe for Mustard Stuffed Chicken from BBC Good Food but no mustard was involved and I couldn't get any nice mozzarella so used some Dolce de Montagne from M&S. 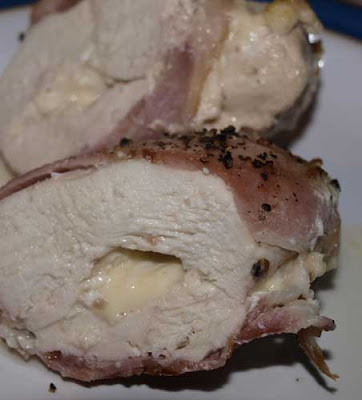 All I did was put the cheese in the centre of the chicken breast and wrapped it in smoked bacon, then put it in an ovenproof dish added a little chicken stock covered with foil and baked in the oven for 35 minutes, then took off the foil for another 5-10 minutes to brown the bacon. I served this is potatoes boulangere, a recipe I haven't made for a while. 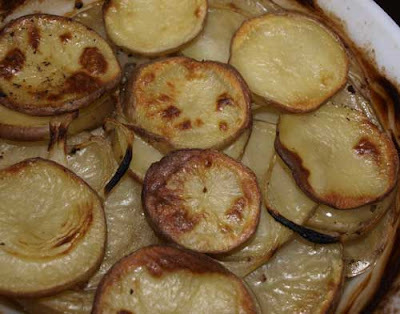 Sliced potatoes are layered with sliced onions and seasoned, pour over about 1/4 pint of stock and bake in the oven for 40 minutes until the potatoes are cooked through. I usually cook it covered and then remove the lid for the last 5 minutes to brown. Are you seeing a pattern here? The cheese melted nicely in the middle -mmm yum! This is what the potato dish looks like when it comes out of the oven, nice and crispy on top and soft and unctious underneath. Chicken and potatoes, yum yum. That's real comfort food for this cold weather. Oh for all I have complained about the bad weather.... at least it gives us the PERFECT reason to make delights such as this! Deeeeeelicious!